Like it or not, if you are a parent, you are the leader of a pack. You owe it to your children to know the how the best leaders lead. First a laugh. TY Doug for giving me a laugh, something to think about, and something to share. Did you laugh? 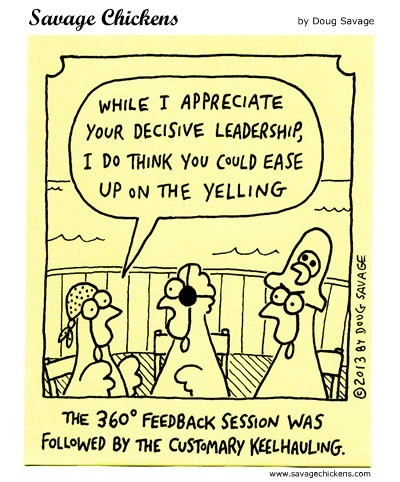 Then you know the drill about being asked for feedback and then being keel-hauled. Bad leadership. Very bad leadership. What to do? These tips and the books mentioned offer the best leadership advice for parents. Parenting tip one: Learn the difference between abuse and punishment. I have worked in the Child Welfare field. I know the difference, Many people do not. What is report-able abuse? Physical abuse involves inflicting harm on a child that leaves marks. Even then there are degrees of abuse. A hard slap leaves a red mark, so that is abuse; but when reported, circumstances may make it unfounded. Why? The mark has usually faded by the time the child protective worker visits. If the slap occurs in public however, and the police are involved quickly, then it may result in what is called founded abuse. The parents will have to go to court and prove their are not abusive. Spankings are not abuse. Only when a spanking is really a beating that leaves marks it is abuse. This runs counter to much of the ranting by many parenting gurus, but most spankings do not leave marks and are the sign of frustrated parenting. Emotional abuse is a bit more complicated and much harder to prove. Briefly it is commonly defined as behavior by parents or caregivers that keeps a child from growing normally. It includes: ignoring, rejecting, isolating the child, corrupting the child. verbally assaulting, terrorizing, neglecting the child’s education, health or mental health. “The words, “Cruising for a bruising? Effective punishments results in changed behavior. All the punishments are effective, when the unwanted behavior stops. The child cannot do what he or she is being asked to do. Why age and stage matter, not just physical age, but also chronological or mental age. The child has become habituated to the punishment. We get used to almost anything. Have you heard about the frog put in a pan of cold water that eventually becomes so hot the frog dies? The more often a certain punishment is used, the less it works. Why it is good to mix things up. Parenting tip four: These books should be read by all parents. The One Minute Manager by Kenneth Blanchard – A quick read that covers all the basics needed to be a great leader. Parents Are People Too by Katherine Gordy Levine – My emotional fitness program for parents. You need to stay calm and in control of your emotions is you are going to put Blanchard’s advice into practice. You can get a used copy for a penny plus shipping or an eBook copy. I think it is a book to keep around and dip into off and on as your child is growing. I wrote it after realizing as a foster mother providing short-term care to troubled teens that if I didn’t control my feelings it was useless to expect my kids to control theirs. Jill Frost’s Super Nanny Toodler Rules. Thomas Phelan’s One, Two, Three Magic. Thomas Gordon’s Parent Effectiveness Training – Gordon’s ideas work well with teens, but have been grossly misapplied to younger children. This link takes you to books and videos by Jean Tracy She is my favorite modern-day parenting guru and provides sound problem solving approaches for the many problems and dilemmas facing most parents. Follow her blog. Word Press’ DAILY PROMPT inspired this post with this question. Dear Leader: If your government (local or national) accomplishes one thing this year, what would you like that to be? Train all parents in the above leadership skills. This entry was posted in Parenting Issues, Wordpress Prompt and tagged adoptive parents, challenging children, Child abuse, children, Emotional Fitness Training, Emotional Health, emotional intelligence, foster parents, Katherine Gordy Levine, parenting, Parenting advice, Parentint books, parents, Parents Are People Too, Punishments, teens, When Good Kids Do Bad Things. Bookmark the permalink.